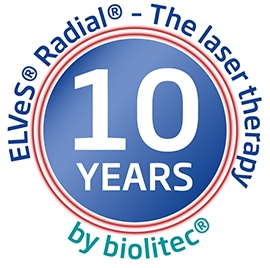 Jena, November 09, 2018 – The laser pioneer biolitec® set standards when it developed the ELVeS® Radial® method for the minimally invasive endovenous treatment of varicose veins and launched it on the market in 2008. The next revolution followed in 2012 with the ELVeS® Radial® 2-ring fiber, which was expanded to include two light rings that divide the laser power into two equal parts of 50% each and thus produce even more homogeneous radiation. The side effects can be reduced even further with a very high occlusion rate, further minimizing postoperative pain and ecchymosis. Since 2017, the ELVeS® Radial® 2ring slim fiber with a diameter of only 1.3 mm has been available and thus offers the possibility of treating perforating veins and side branches as well as more complicated anatomical structures and stripping relapses in addition to the larger trunk veins. In urology the minimally invasive laser treatment LIFE of biolitec® with its channel technique is particularly suitable for the treatment of benign prostatic hyperplasia in high-risk patients. Urologists at Harasanshin Hospital Fukuoka in Japan helped develop this special channel technique and operated on 26 patients who either suffer from diabetes and/or have to take anticoagulants. With the channel technique, surgery could be performed much faster than with conventional procedures – on average 1 hour – and a large cavity could be achieved without having to remove the tissue completely. Side effects such as swelling, dysuria or retention, which are particularly common in large glands, did not occur. Already at the beginning of this year biolitec® presented its „Sharp tip“ laser fiber especially for microsurgical procedures. This needle-shaped fiber tip is the first laser fiber worldwide that can cut and coagulate without coupled or adapted separate endings. The surgeon can easily guide the glass fiber and thus in most cases completely replace the classic scalpel. This enables even safer handling compared to conventional laser systems. The „Sharp tip“ fiber is the first laser scalpel made of a homogeneous piece of glass fiber that can be used, for example, to perform slip-eye operations simply and precisely. The biolitec® team presents at this year’s Medica in Dusseldorf at booth H46 in hall 10 not only the above mentioned innovations but also the complete range of the proven LEONARDO® laser family.